Scott McLaughlin (DJR Team Penske) sweeps the Perth SuperSprint at Barbagallo Raceway, the fifth round of the 2018 Virgin Australia Supercars Championship. 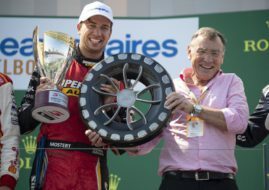 It’s the second in a row clean sweep this season for McLaughlin after he won both races in the previous round at Phillip Island. The driver of the #17 Ford Falcon has five wins in twelve races this season for a dominant lead in the championship. After a dominant win in the first race, starting from pole and leading for 50 laps from lights to flag, McLaughlin made an impressive effort in the second race, starting from P19 and winning the race. In the first race, Mark Winterbottom finished second in Tickford Racing’s #5 Ford, ahead of Shane van Gisbergen in the #97 Red Bull Holden. In the second race, McLaughlin had a race of his career, making an incredible progress from P19 to P1. David Reynolds (Erebus Racing) finished in the second place, ahead of Craig Lowndes (Triple Eight) who also made a fantastic progress from P25 to P3. After twelve races in 2018, Scott McLaughlin leads Shane van Gisbergen by 158 points in the championship. David Reynolds is third, ten points behind SVG and twenty-six points ahead of Craig Lowndes. The next event on the Supercars calendar is the Winton SuperSprint at Winton Motor Raceway, scheduled for May 19-20.